This will be a practical task where you use the technical codes and conventions of film making, alongside the styles and theories we have studied in these sessions to create a cinematic trailer for the Level 3 Acting Performance of ‘Macbeth’. For this task we will work as a whole group on both a Thursday and Friday to devise, plan and create the trailer in time for the evening of the performance. The emphasis will be on applying the experimental techniques we have studied in the film studies project, with the standard techniques developed in the Fiction Project, alongside the technical knowledge developed in the Friday sessions, to produce a striking, experimental trailer that suitably portrays the central themes to the viewer. Length of overall trailer will be: 90 – 120 seconds. Our class got together with the level 3 performing arts students to create a short promotional video for their upcoming show “Macbeth.” It was a very rigorous all day shoot. All of it was shot with a canon 7D and 550D down in the boiler room of our college. It was the perfect scenery for the look we were trying accomplish and gave a great overall atmosphere and tone to the video. We each took turns taking a considerable amount of time to compose each of our shots, making sure we light our shots perfectly. 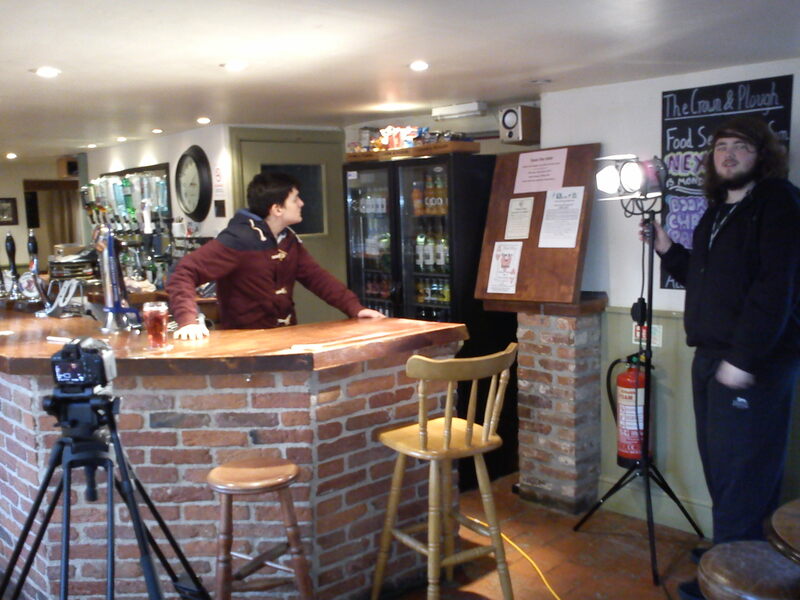 We decided to use two 300 watt lights with one 650 watt key light. 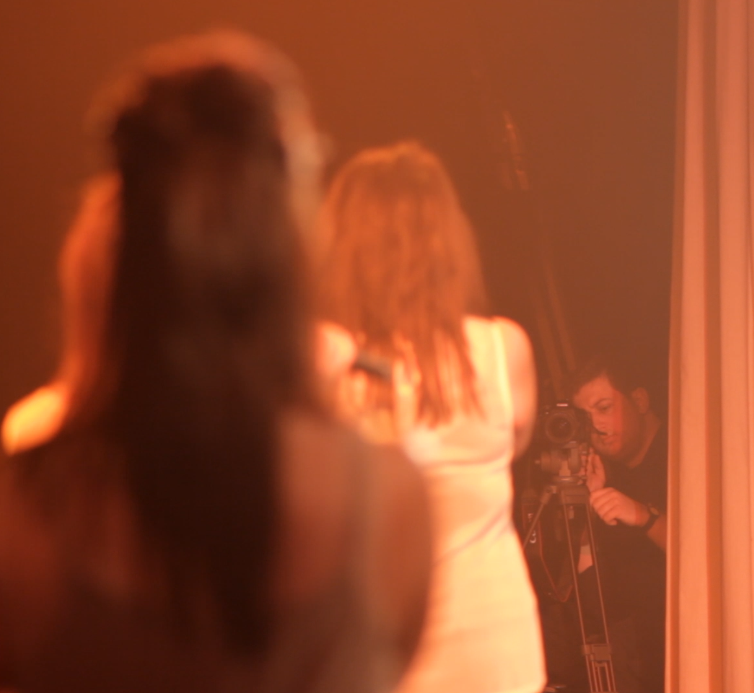 We also used a selection Carl Zeiss prime lenses which gave our shots a very distinct look and feel to them. This limited our depth of field which meant our actors/actresses had to hit specific marks in order to be in focus. The opening shot we used the glide track to film a demented baby doll, we also had to hit certain marks with the use of timing to the song we decided to edit with. Altogether this day went extremely well with the help of everyone collaborating efficiently. While I was in London filming the city portion for my capture the spring in England, My cousin asked me to film his band having a jam session. I thought this was a great opportunity for me to capture some of their original work, and help my cousin out promoting his band. This was filmed in the late night of my aunties kitchen in Hackney, East London. Barry, my cousin, is the one playing the guitar. This song is called All the Time in the World, and it is about people with too much time on there hands. I picked this song out of all the ones I filmed because it has such a unique sound and catchy melody with the ukulele, as well as the excellent lyrics, they are just the icing on the cake. The singer has so much passion while singing this song it is unbelievable. I originally wasn’t going to post this on my wordpress, but I really loved it that much I had too. Although it’s just one shot and unedited, I still filmed it, and I’m glad I did. This is a great video to have and I’m sure it will promote there band further and get there music out there. 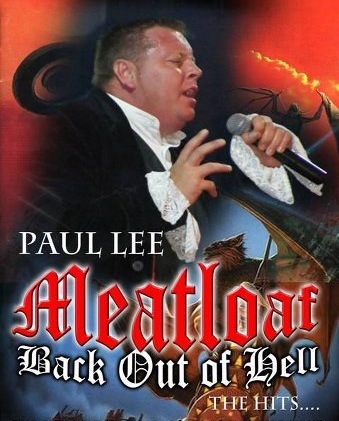 On Friday the 8th of February, Pete Bendoris, Joey Lever, Gareth Skinner, and myself filmed Paul Lee who does covers of Meatloaf at Brooksby Melton College. This was the first time he had his friends along side him to duets and collaborations of classic rock at it’s very best. All four of us had our own Canon 550D with multiple memory cards and batteries if we happened to run out. 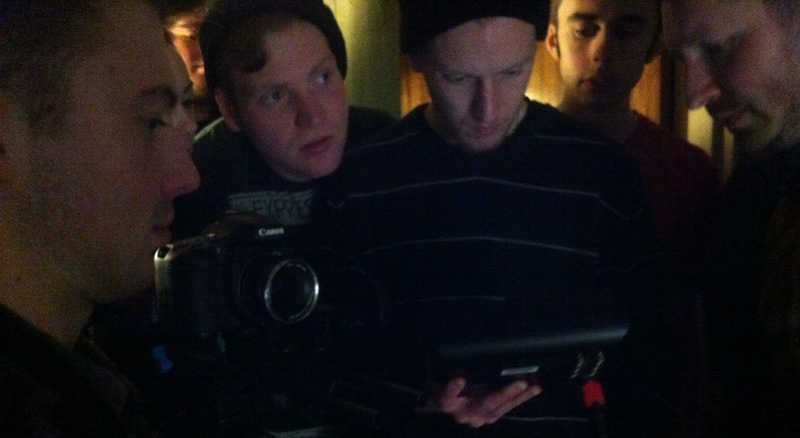 We filmed 1080 x 1920 at 25 frames per second. I shot on stage left with an 80mm fixed lens and my job was to get close-ups, facial expressions and play around with the manuel focus and do focal pulls to change the depth of field. The show lasted 2 hours with a 30 minute break in-between. 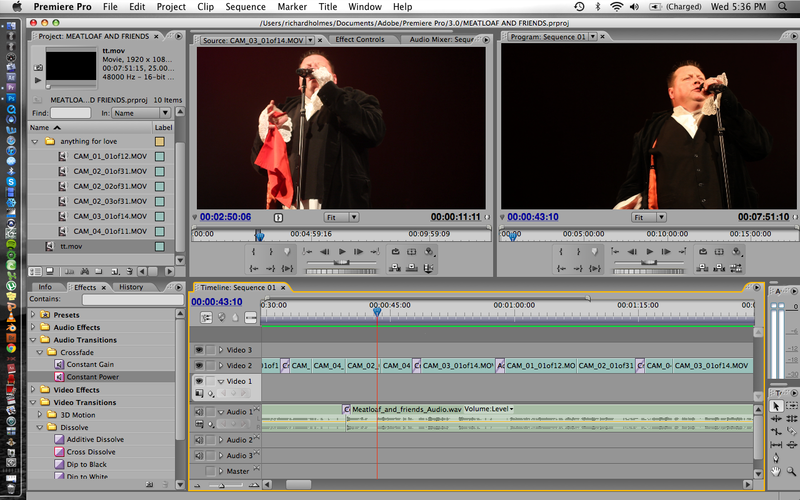 We used the break to export all of the footage we shot onto our Macs. For the audio used in the video we had the audio technician in the sound booth record the entire show straight to one of our Macs. Pete Bendoris did a lovely job directing and planning out all the details because he had the most experience with multi-camera shoots. Photos taken by Joey Lever. 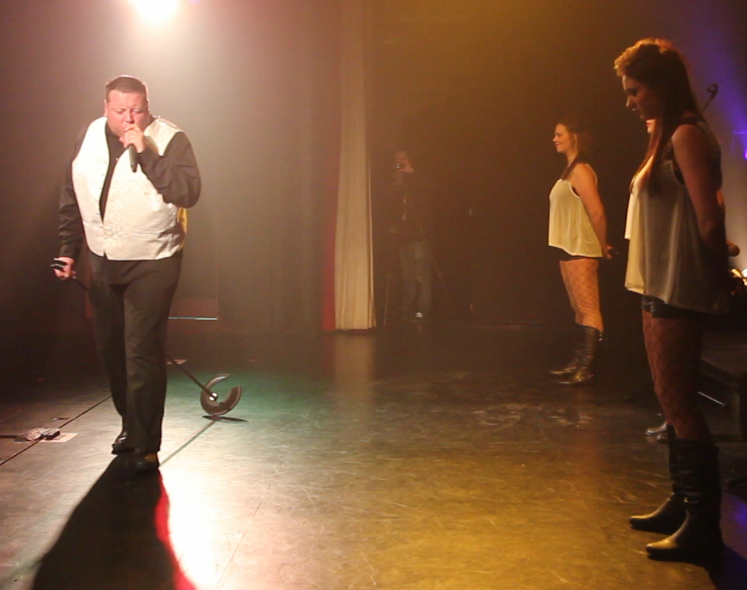 I edited this video in Adobe Premier Pro, using the footage we captured I decided on the opening song from Paul Lee’s performance “Anything for Love” a tribute from Meatloaf. I wanted to use Adobe Premier because I am not that familiar with it as I mostly use Final Cut Pro. 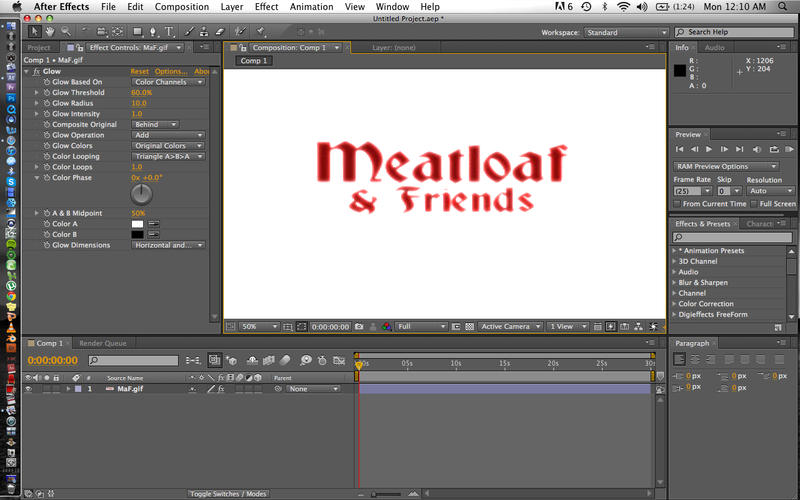 I also used Adobe photoshop for the title “Meatloaf and friends” taken from a flyer off of his website. I erased the background and then stuck the image into Adobe After Effects, I used a glow effect around the lettering, added in rain, and used key motion for a Ken Burns effect. The one problem we did run into was that because Pete Bendoris and I were facing each other we did pop up here and there in bits of the video. Next time we should possibly have a 5th and 6th camera person to have more footage to cut too when we appear in each others shots. Overall I believe we did a great job considering the amount of time we had to get ready, plan everything out, and get all set up. 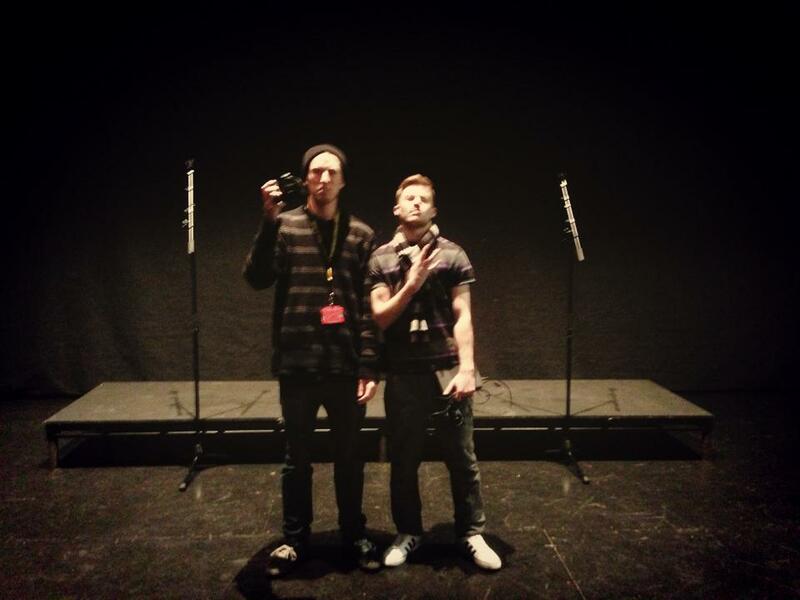 Me and Gareth Skinner on stage after the show had ended (and Gareth throwing up the west side). Drinkaware invites YOU to create a short film aimed at young adults highlighting the importance of having a good time this Christmas, while drinking responsibly. Synopsis: It fades from black to a pair of friends that are in a pub and they’ve just finished their pints of lager. One friend leaves and returns shortly to find his other friend has purchased him another pint. He says, “Here you are Mate.” Then it zooms in on the friends eyes and while he thinking, we hear sound effects describing if he would have had another pint and if he got too drunk, such as people arguing, and then a blurry visual of himself throwing up with a sound of a toilet flushing. Then the friends blinks and comes back around and instead or rudely refusing the already paid drink, he simply responds, “Thanks, but I think I’ll wait a bit.” It then has a shot of the two pints and at the bottom of the screen the campaign tip: Turning down a drink is less embarrassing than throwing one up. Then it slowly fades out. Here we are beginning to set up our 3 point lighting, making sure all lighting wires are taped to the ground, the tripod is secure, and establishing our shot for the drink awareness video. 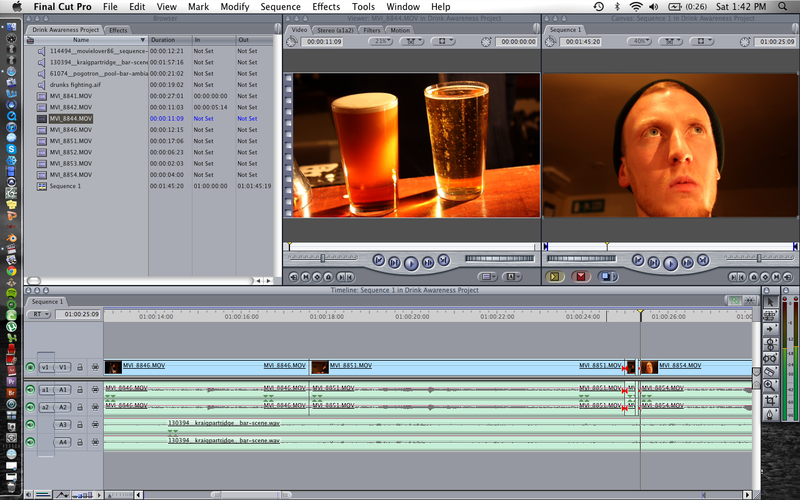 Here is a screenshot of myself editing the drink awareness video in Final Cut Pro using the shots that I have picked out and put in my edit decision list. Below are release and consent forms signed by the manager of the pub and by myself to give us permission to film there . Drink Awareness also needed consent from everyone starring in the video so we had to sign there consent forms as well.